The millions of anonymous people, all the institutions, all the heads of state and government, all the political, intellectual and media celebrities, all the religious dignitaries who this week proclaimed “Je Suis Charlie” should know that also means “I am secularism.” We are convinced that as far as most of our supporters are concerned, that goes without saying. The others can do what they like with it. via National Secular Society – Charlie Hebdo Editorial: Je Suis Charlie Means Je Suis Secularism. This is a translation of the editorial from the first Charlie Hebdo published since the Paris attacks. 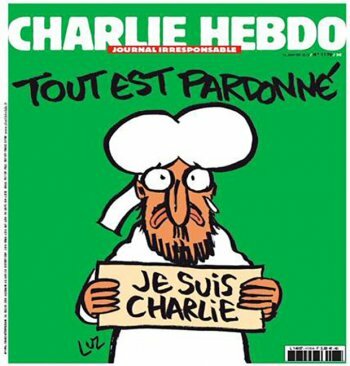 It is reproduced here in solidarity with Charlie Hebdo.